Wow! It looks as though Batman's just been kicked in the gut and is about to unleash some unbridled fury on some poor ne'er-do-well's face. The rich, expressive folds on the fabric of Batman's cape is among your best to date. Look out Lee Bermejo! Design. Next. Batman. Movie. Costume. Ok, more words: I really wish that Batman's costume could look this cool on the big screen. Watched the first one (1989) last night, and I think that's as close as Warners ever got to a truly intimidating costume. Anyway, great work! This is what I find amazing. This character has been drawn in this pose by hundreds of artists, but this looks so good. You always find a way to make it interesting and fresh. Excellent. Great looking Batman...looks like someone is in for a beat down! 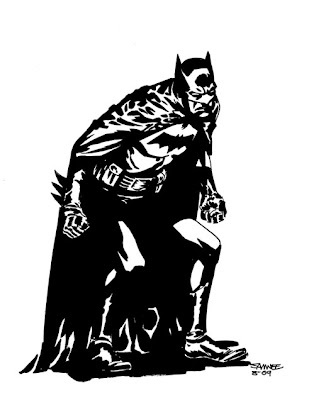 Awesome inks and the cape folds are wonderful....When Bruce come back I hope your the one welcoming him back to Gotham!